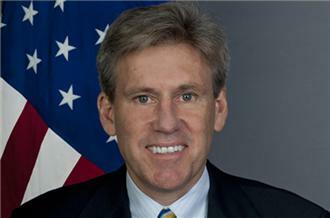 The US Ambassador to Libya, Christopher Stevens, was killed earlier today in an attack on the Consulate in Benghazi. An armed mob attacked and set fire to the building in a protest against an amateur film deemed offensive to Islam’s Prophet Muhammad, after similar protests in Egypt’s capital. The ambassador was paying a short visit to Benghazi when the consulate came under attack on Tuesday night, Al Jazeera’s Suleiman El-Dressi reported from the eastern Libyan city. He died of suffocation during the attack, along with two US security personnel who were accompanying him, security sources told Al Jazeera. Another consulate employee, whose nationality could not immediately be confirmed, was also killed. Earlier in the attack, there was another Consular employee killed. And in our Embassy in Cairo, protestors pulled down the American flag and replaced it with an Islamic one–reportedly an al Qaeda one. There were reports that Ayman al-Zawahiri’s brother was involved in the Egyptian attack. Note that Stevens was also the liaison with the Libyan National Transitional Council. This man helped Libya overthrow Moammar Qaddafi. Already, there have been a lot of condemnations of the killing from Libyans and other Arabs. Details about both attacks are still coming out, and State is trying to play down the degree to which Salafists were involved in both. I’ll be curious to learn whether the mob had reason to know Stevens was at the Consulate when they attacked. Condolences to Stevens’ family and the families of all of those killed in these attacks. Washington’s backing of Salafis on their quest to overthrow previously stable (or at least semi-stable) authoritarians in the Middle East will have significant blowback. This is just the first direct evidence. Why are we so excited by the “Arab Spring”? And why do we so strongly support it – even against the dictators we own like Mubarak? Is it some failing/failed grand strategy? Is it kowtowing to the severe pro-Israel bend in our foreign policy and a program to destablize Israel’s neighbors out of some sense of protecting that nation? Or are our current masters in the Administration so enthralled with the language of “democracy” and “progress” that they cannot understand that there are hundreds of years of culture still to change before any part of the Middle East can come to look like the West? I prefer to believe we remain as always, foolish, naive and arrogant Americans. Blundering around the world supporting causes that sound good on the Sunday talk shows and believing they will earn some domestic votes come some November. The truth may be this simple. Condolences to the families and friends of these patriots killed overseas. Their names will join a long list of others on the south wall of the State Department lobby. And others will go on that wall after them. So long as we are willing to act with impunity and arrogance globally, we cannot get upset when those acted upon react. Especially the salafis. And especially on 11 September. According to an update at The Guardian, the attack in Benghazi started before the ambassador arrived on the scene. Latest information from our correspondent in Libya is that the US ambassador, Chris Stevens, went to the consulate this morning to inspect the damage. His car was reportedly attacked, killing him and two bodyguards. That was as of 50 minutes ago. When is Islam going to mature sufficiently for scholars and religious leaders to readily condemn these violent responses to “criticism” of the Prophet? Oh, I forgot, we don’t seem able to condemn the “Christian” zealots either. Aren’t the Marines guarding these embassies armed and where were the local security officials? Note: one person who has not yet commented, AFAIK, is Egyptian President Morsi. Libya’s has though. QUite forcefully. Dept Statement on the Attack in Benghazi. Seems like a very complicated process unfolding in the Middle East. Michael Hayden sure seemed pleased recently with how things are going. Whatever that means. Hounshell notes that the film at the centre of yesterday’s attacks may have been obscure before, but it isn’t now. I wonder who would benefit from that? The film was made by an Israeli filmmaker, Sam Bacile, who has gone into hiding. The film was promoted by Morris Sadek, an extreme anti-Muslim Egyptian Christian campaigner who lives in California. Bacile, 52, admitted he had not anticipated such a furious reaction to his film and said: “I feel sorry for the embassy. I am mad”. The full film has not been shown yet, he said, and he said he had declined distribution offers for now. The two-hour movie, “Innocence of Muslims”, cost $5m to make and was financed with the help of more than 100 Jewish donors, said Bacile. And immediately “pro-gaddafi forces” are blamed. What an insult to the family of the dead. They serve in death as they did in life. In service of Machiavelli. @harpie: Liz Cheney is also mentioned in the FP article. Moon of Alabama suggests the film is just cover for revenge for our killing of Abu Yahya al-Libi. And now there are reports of Salafist protests outside our embassy in Tunis. Some background on and quotes from the film-maker here. @emptywheel: Thanks for the Moon of Alabama link. The film is being used by both sides to incite the rabble to riot. I’m still reading the MoA linked speech by [former] Ambassador Chas W. Freeman, but so far it’s quite interesting. @greg brown: Yeah. Well, there’s a discussion of that over at Murray’s blog post. You can argue with his readers and [maybe] him about it over there. More confirmation this is about al-Libi and not the movie, including from Bill Nelson, who’s on SSCI. @emptywheel: Will you add the info in an update? I’m curious to read what he has to say. Thanks. this death is a tragedy for stephen’s family and friends. it is also a great loss for the united states – the loss of highly-trained talent in an area of the world where the united states badly needs such talent to help understand and shape events. stephens had worked in the muslim world since serving as a peace corps volunteer. he spoke arabic and french. Stevens was born and raised in Northern California, and graduated from Piedmont High School in 1978. He earned his undergraduate degree at the University of California, Berkeley, in 1982. From 1983 to 1985, he taught English as a Peace Corps volunteer in Morocco. He graduated with a Juris Doctor (J.D.) from the University of California, Hastings College of the Law in 1989. He later studied for a Master of Science (M.S.) from the National War College in 2010. He spoke Arabic and French. Prior to joining the United States Foreign Service, he was an international trade lawyer based in Washington, D.C.
Stevens joined the United States Foreign Service in 1991. His previous overseas assignments included: Deputy Principal officer and Political Section Chief in Jerusalem; political officer in Damascus; consular/political officer in Cairo; and consular/economic officer in Riyadh. In Washington, Ambassador Stevens served as Director of the Office of Multilateral Nuclear and Security Affairs; Pearson Fellow with the Senate Foreign Relations Committee; special assistant to the Under Secretary for Political Affairs; Iran desk officer; and staff assistant in the Bureau of Near Eastern Affairs. He served twice previously in Libya, as the Deputy Chief of Mission from 2007 to 2009 and as Special Representative to the National Transitional Council from March 2011 to November 2011 during the Libyan revolution. He arrived in Tripoli in May 2012 as the U.S. Ambassador to Libya. This comes via a commenter at Glenn Greenwalds column at the Guardian. I haven’t heard of Quilliam before. that was interesting and sounded credible. (and greenwald’s commentary on important aspects of this emotional topic was simply masterful). The military assault against the US Consulate in Benghazi should not be seen as part of a protest against a low budget film which was insulting Islam – there were just a few peaceful protesters present at the event. Indeed, there have been no other demonstrations regarding this film in Libya. (Was the interview I heard from Egypt maybe?) …though iirc the man agreed that the youtube was not worth the response it caused. Lots of Stevens’ cables over at Wikileaks Cablegate site. heard in other parts of the country…..
officials that the east is under control may be overstated. Too bad that Stevens, no doubt a Department man who went along with US policy, got caught up having to support the very extremists he knew were problematic. It was the US policy of embracing Salafists that killed Stevens. Why does the US do this? Well both the US and Britain have done this for decades. It is part of the way the imperialists rule, by allying themselves with the most reactionary sectors of society, the better to control the toiling classes and keep them from organizing with a left program. Remember, (and he was not an Islamic zealot at all), the US backed Saddam and made him a made man when he showed he was willing to kill Communists and left-nationalists like Qassim. Or the alliances with fascistic groupings in Europe and Latin America, all in the name of anti-communism, or to destroy unions or land reform groups. Play with fire, be prepared to be burned. That’s what 9/11 was all about, btw. CLASSIFIED BY: Chris Stevens, DCM, Embassy Tripoli, State. enthusiasm for the merger. End summary…. the next regime will be less oppressive…. to be rid of Qadhafi’s regime, whatever the cost. End comment. uk, i believe, has a relatively large muslim (commonwealth immigrant)population, does it not? OY! I really don’t like the sound of that. This is being characterized as a terrorist attack? A U.S. source told CBS News investigative producer Pat Milton that authorities were “leaning” toward the theory that al Qaeda planned the attack and that the protest seems to have been a fortuitous coincidence for the militants. The fact that some of the attackers were armed with rockets and grenades is one of the factors leading to that initial conclusion. Wanis al-Sharef, a Libyan Interior Ministry official in Benghazi, said there had been threats that Islamic militants might try to take revenge for the death of al Qaeda’s No. 2 commander Abu Yahya al-Libi, who was killed in a U.S. drone strike in Pakistan in June, and he said the U.S. consulate should have been better protected. I’m confused because when victory was declared in Libya, Al Qaeda like flags were flown in Benghazi and there was no sign of any problem with that. Military officials told CBS News an anti-terrorism team of U.S. Marines was being deployed to Libya to help secure U.S. interests in the country following the attack. The State Department said, however, that no Americans were remaining at the facility in Benghazi. State officials would not confirm how many Americans were evacuated, or to where. Does anyone know which security firm the State Dept. uses in Libya? Is is a Blackwater company? More info coming in and the details have changed considerably since the initial reports. Thanks for keeping up with this, Joanneleon. Our next Secretary of State? Also chetnolian, I meant to bold your name, @28, to make sure you saw it. Sorry. My own view is that those who have adopted religous fanaticism – for whatever religion – display an absence of good judgement. Ed Husain is by his own account a former religous extremist. He is one of the leaders among those who realised that, having tried to make a mark in the world through religious fanaticism, they can make more money and career progress by turning traitor on their former beliefs and colleagues, and jumping on the anti-Islamist gravy train. Both the original fanaticism and the high profile and lucrative betrayal are evidence of a sociopathic character. Speaking of ‘Quilliam’, note that Noman Benotman, originally the UK based ‘top man’ for the Libyan Islamic Fighting Group (LIFG), was appointed in 2010 as a Senior Analyst (Strategic Communications) at the Quilliam Foundation. What a difference a week makes. Everyone is correctly outraged at this violent attack on US diplomats. Where is the diplomatic immunity? Mittens wants to go to war with other people’s sons. But the US and Britain were quite willing to violate diplomatic immunity to kill or capture Julian Assange. And most of these hypocrites in Dee Cee also supported that violation of international law. To answer your earlier point, the UK does indeed have a large Muslim poulation, mainly from Pakistan but including many other ex Imperial origins. Not surprisingly the relationships between the UK and Pakistan (and other parts of the old Empire) are often close but confusing. Craig Murray’s views do represent a widely held view on Quilliam, especially Ed Hussein, but may not be any more balanced than theirs. There is a really strained divide among UK leftwing intellectuals, especially on the extent to which, in embracing multiculturalism, you find yourself accepting views from other cultures you would condemn in your own culture. I admit to being a bemused observer of this and at a loss as to the right answer. We all love our freedom of speech, especially in the Free Speech cages. Anyone should have the right to make a film, if it is presented with honesty and art. That does not include the fake government Bin Laden videos. “Innocence of Muslims” is a fraud and a fake also. No freedom of speech for liars who are trying to create more wars. The “producer” “Sam Bacile” is not a real person. The actors in the film claim that they were misled about the story and plot. And they repudiate this trash. Someone paid $5 million dollars to make this. It gets murkier and murkier. Apparently the cast and crew thought they were working on something about Egypt under the Romans, and the film (or at least the part of it that showed up on Youtube) was overdubbed (badly) to make it anti-Muslim. The alleged producer is a Copt, who has used several names, was apparently involved with that Qu’ran-burning minister in Florida, and somehow the video was put up and publicized in a way that got it seen primarily by North African Muslims. @chetnolian: Thanks for that. It’s difficult to find the right answers…maybe there are none. good lord! who could think this stuff up? with the internet, any individual can be a player in foreign affairs – or domestic. tx for this info, pj. What an incredibly sad day.